We are committed to delivering excellence and offering choice to our clients. 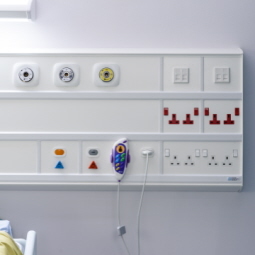 Using our specialist knowledge and extensive experience of healthcare environments, we have designed a range of bedhead and medical services trunking solutions that enhance the patient experience whilst delivering benefits for clinical staff and project installation teams. With extensive design and manufacturing capability we provide BIM data & models, CAD drawings and technical support throughout the early stage design process. Workshop sessions with other supply trade specialists and construction teams can be arranged to discuss co-ordination, logistics and manufacturing issues to ensure off-site work is carried out efficiently and to an agreed programme. Our manufacturing facility has fabrication and assembly capabilities. Units can be supplied pre-assembled or in kit form. Our bedhead and medical services systems meet with all relevant Health Technical Memorandum (HTM) requirements, CIBSE LG2 lighting standards, and are approved as a Class 1 Medical device. Features for infection control, improved reliability, energy efficiency, ease of upgrade and servicing have been thought of and included. We supply projects extensively throughout the UK and overseas. Vistr Headwall® is a bedhead services solution with character. An aesthetically pleasing solution for when style matters. The market-leading alternative to horizontal bedhead services trunking.